This can be seen in the fact that the largest church in America is pastored by Joel Osteen, the supreme icon of this shallow gospel of health and wealth. And some of the largest churches in other parts of the world preach the same kind of message. Christianity may be especially splintered nowadays, but the word “Christianity” retains a solid meaning. It can still be used to properly denote a variety of traditions falling under its larger category. It refers to Catholics, and Greek Orthodox, and Southern Baptists. But, there comes a point where what is believed is so divergent from the traditional, ancient, universal Christian message that it is, for all practical purposes, no longer the Christian message. How do we measure this exactly? Well it’s more of an art than a science. But the good news of the Lordship of Jesus Christ being diminished to the hope of health and wealth is surely not anything like the Christianity of the past two millennia which is reflected in the New Testament. If anything, it is indeed heresy–i.e., something other than what is the original good news of Christ. This original gospel is about the kingship of Jesus, the defeat of sin and evil, and the eternal worship and enjoyment of God in righteousness and justice. The prosperity gospel has made it about you and your satisfaction with your stuff. It can be stated unequivocally that Luke-Acts–the scriptural witness that speaks most emphatically about the human use of possessions as a response of faith–bears no trace of the contemporary heresy called the prosperity gospel. However much televangelists and others trumpet the “scriptural” character of their claim that faith brings with it material prosperity, their selectivity with regard to the Bible is far more severe than that practiced by Christians who have followed one of the classic options for sharing. They choose to follow a handful of Old Testament texts in the Deuteronomic tradition, and ignore completely the unanimous witness of the New Testament, which portrays discipleship not in terms of worldly success, but in terms of radical obedience and service–service that involves the sharing of possessions rather than the accumulation of them. There is simply no gospel character to the claims of the prosperity gospel, no element of genuine Christian discipleship. My task will always be on this blog to write about the “full New Testament message” to which Douthat refers. May I also live in it and hope in it. Such a great post! The fact that some are using scripture to excuse and even celebrate our (but THEIRS even more so) selfish and materialistic lifestyles should give us pause. The gospel of Christ is about OUR transformation now our accumulation of stuff which Christ clearly indicates we are not supposed to be focused on and worried about. Thanks Michelle and Donna. It certainly isn’t a matter of stuff being the problem, or else we wouldn’t have the promises in the Bible of God blessing us with stuff, especially in the end when we will inherit all things. 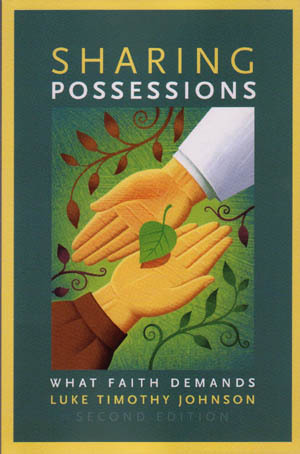 The quote from Johnson comes from a book that is all about Sharing Possessions — you can’t share unless you have.